We had another snow day today... We've now used up all our "free days." Boo! 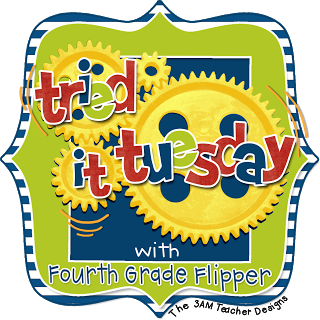 But, with my free time I decided to link up Holly at Fourth Grade Flipper for another installment of Tried it Tuesday! This week's "tried it" is not directly school related since it's more of a healthy living post... So, skip over if you're looking for classroom ideas. Mine is not wireless but plugging it into my phone really isn't that hard and I don't need to see my steps instantly. I upload about two - three times a day and that is good for me. It only takes seconds to sync and upload! Plus, all my calories are automatically shared through the My Fitness Pal app. So if you're looking for something to get you motivated this year here are a few things to consider before purchasing an UP. - It links/syncs to multiple apps you're probably already using like My Fitness Pal, RunKeeper, or Lose It! - It's like wearing a rubber bracelet and it's NOT noticeable. Only one student even commented on my new band. Plus it does come in several colors. - Allows you to track your sleep, steps, and mood over time. - Can create a "team" so you can view and comment on others progress. This one definitely holds me accountable! - Holds charge for 10 days! - You have to tell the band you're going to sleep or your sleep won't be logged. - Some of the calorie information from my Fitness Pal is listed on the UP app so always do a check if you're watching things like carbs or fats. - Can't wear it or use it while it's charging... no way to manually log activities through the UP app. So far, I love my Jawbone UP. If you want to research the UP or check out the new wireless UP 24 visit the Jawbone website. For me, I just needed an extra push to get motivated and moving! I've already been close to hitting 10,000 steps and seeing my time inactive was a real eye opener! I'm hoping this combined with better eating and calorie counting with will help me towards a happier and healthier 2014! Look at you! You go girl! I'm not sure I want to see my sleep trends! Yikes! It would probably be a flashing red warning light! I think it's great that you and your family are all involved! That's awesome! This looks pretty motivating. I may have to try it out. Thanks for the pros and cons list. My best friend and roomie has one and loves it. I might grab it off her arm when she's sleeping and try it out. Shh...don't tell her! I got a Fitbit Zip a few months ago and I love it! I love the sleep monitoring feature. Thank you for sharing this!